Akt 16 to be issued. Perched on a beautiful green hill overlooking the Black Sea Hills and Sea Complex is nestled between vineyards, a forest and a small river further down. The area (being a natural reserve called Batova gora) is very picturesque and suitable for hiking among the virgin nature, fishing, and hunting a variety of game. The air is healthy and clear; summer starts in May and ends in October; the ecologically clean environment is an excellent prerequisite for a peaceful and healthy living. 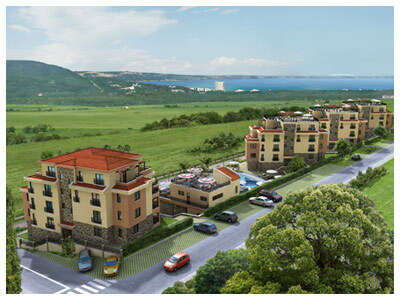 Hills and Sea Complex is conveniently located 25km. away from Varna Airport, a busy charter flight airport from March till November. 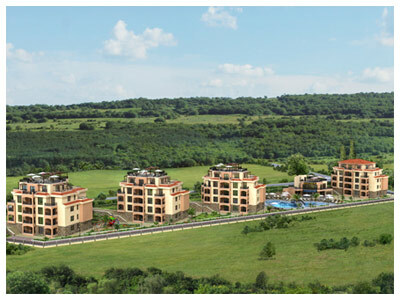 The Complex’s proximity to Albena Resort (4km.) is a great advantage as you can enjoy there a marvelous stretch of beaches, calm and safe sea, clear water and healthy air, fine golden sand and natural dunes. A great variety of entertainment and amusement places are available in the resort- local restaurants and pubs and all kinds of sports as well- fishing, wind-surfing, sky surfing, yachting, water-skiing, parachute diving, paint ball, jeep safari, horse riding etc. Two other attractive resorts on the Northern sea coast are not far away from Hills and Sea Complex as well.The Golden Sands sea resort is only 10 km away and if you keep driving to the south you get to St. St. Constantine and Helena resort /26 km away/. The city of Varna, called the Sea capital of Bulgaria , is 20 km to the south. It is a city of old culture, living traditions and ambitious undertakings. Varna boasts hundreds of sights including museums, galleries, cathedrals, Roman baths, and many areas of archaeological importance. Located 15 km. north of Hills and Sea Complex is Balchik where you will find an amazing historic town famous for the Palace of Romanian queen Maria and its exotic botanic gardens. Driving further north you will reach Kaliakra Cape. The beautiful cape stretches 2km deep into the sea and consists of 60-70m-high limestone rocks, the inaccessibility of which has been the main reason for the construction of an ancient fortress named Tirisis there. Usually, it is the final stop of foreign tourists looking for pretty sights and interesting places. Further north is the town of Kavarna that will fascinate you with its ancient history dating from the Thracian times and its many extraordinary places, like the remains of Roman villas and walls, medieval buildings and churches, two natural reserves and much more. The modern-style Hills and Sea Complex is perfectly located to combine the feel of coastal and peaceful lifestyle. It consists of four villa Mallina each of them consists of 9 studios, 10 one bedroom and 3 two bedroom apartments. 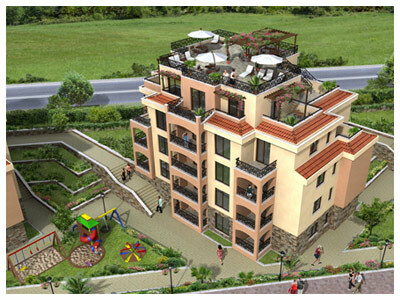 All apartments are finished in Mediterranean style and are boast of wonderful spacious terraces. Villa Mallina 1 will be finished for 2014 summer season.